Today marks a dark day in America's history. On November 22, 1963, President Kennedy was assassinated in Dallas, Texas. Though that day represents a moment that touched people across the nation, it hit close to home for the Dallas Police Department and Police Officer J.D. Tippit’s family. Just minutes after President Kennedy was assassinated, the suspected gunman, Lee Harvey Oswald, shot and killed Officer Tippit, who had stopped his cruiser on 10th Street to question him. Officer Tippit left behind his wife, Marie, and three children. In May 2008, Marie Tippit had the opportunity to visit the Memorial and see her late husband's name engraved on its marble walls. A few years ago, fellow Dallas officer, Detective James Leavelle, visited the Memorial for the first time to see his friend Officer Tippit’s name. Detective Leavelle was handcuffed to Lee Harvey Oswald, escorting him through the basement of Dallas Police Headquarters, when Oswald was shot and killed by Jack Ruby. In June 2011, Mr. Leavelle spoke at the Museum’s first Witness to History event. Also in attendance at that event was Clint Hill, the Secret Service Agent in charge of the first lady, Mrs. Kennedy. 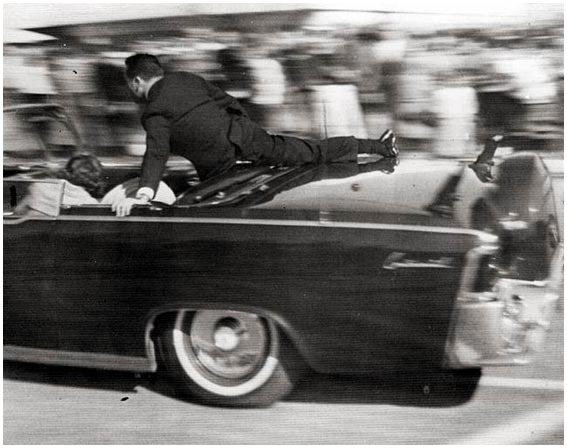 Agent Hill can be seen jumping onto the back of the limousine to protect President and Mrs. Kennedy in the iconic photo taken right after President Kennedy's murder. This October, the National Law Enforcement Museum acquired an important piece of history—the crime scene photos of Officer J.D. Tippit’s cruiser parked on 10th Street shortly after his death. To learn more about the photos acquired and about Officer Tippit's story, visit the National Law Enforcement Museum Blog. Today, a wreathlaying ceremony was held in honor of Officer Tippit at the National Law Enforcement Officers Memorial. Memorial Fund staff and guests attended, and Chairman & CEO Craig Floyd shared some brief remarks. "Today we honor and remember a true American hero, Officer J.D. Tippit,” he said. “To remind all of us of his sacrifice, and to remind our visitors who will come through these Memorial walls over the next few days of his special place in history, we would like to place a wreath in his honor." This past Saturday, a very special fundraising event was held for Officer Scott Williams at Kelly's Irish Times in Washington DC. The Renegade Pigs, a non-profit organization comprised of active and retired public safety officers, were the organizers of the event. Officer Williams was badly injured in the Navy Yard shooting in September. The Washington, DC Metropolitan Police Department K-9 officer was shot in both legs, cracking his femur bone in one leg and shattering it in the other. Organizers collected $20 at the door, sold shirts and held a silent auction. More than 300 people attended the event helping raise more than $8,000, with 100% of the proceeds going directly to Williams. Memorial Fund Chairman & CEO Craig Floyd was in attendance at the event and had the opportunity to speak with Officer Williams, as well as with NCIS Special Agents Brian Kelley and Ed Martin, the officers who rescued Officer Williams and carried him to safety after he was shot. 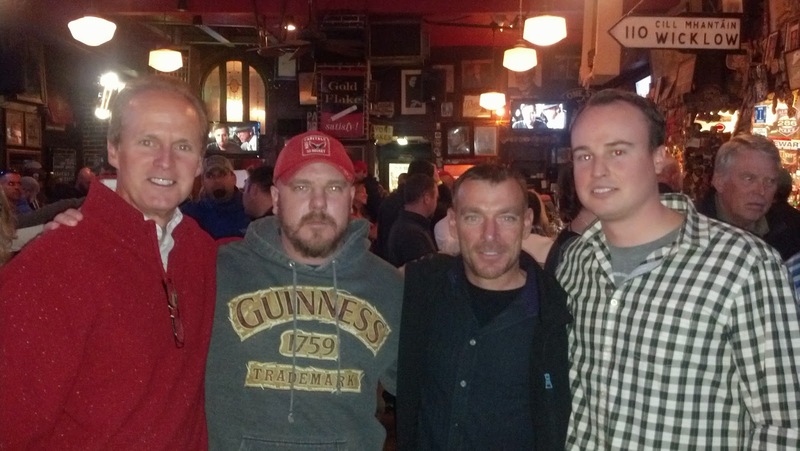 Special Agent Brian Kelley, Officer Scott Williams, and Special Agent Ed Martin. For more information about this fundraiser, please visit WUSA 9's website. 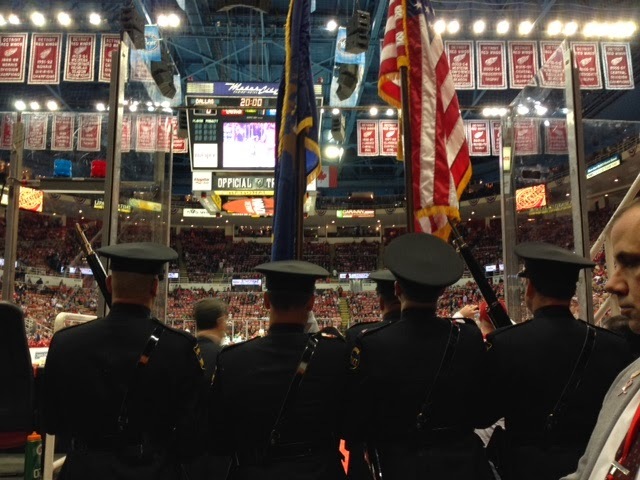 Last night, over 20,000 fans were in attendance as the Detroit Red Wings hosted their 3rd Annual Law Enforcement Night in Detroit, Michigan at Joe Louis Arena. Around 1,000 law enforcement personnel from Michigan, Ohio, Indiana and even Canada attended this special night. 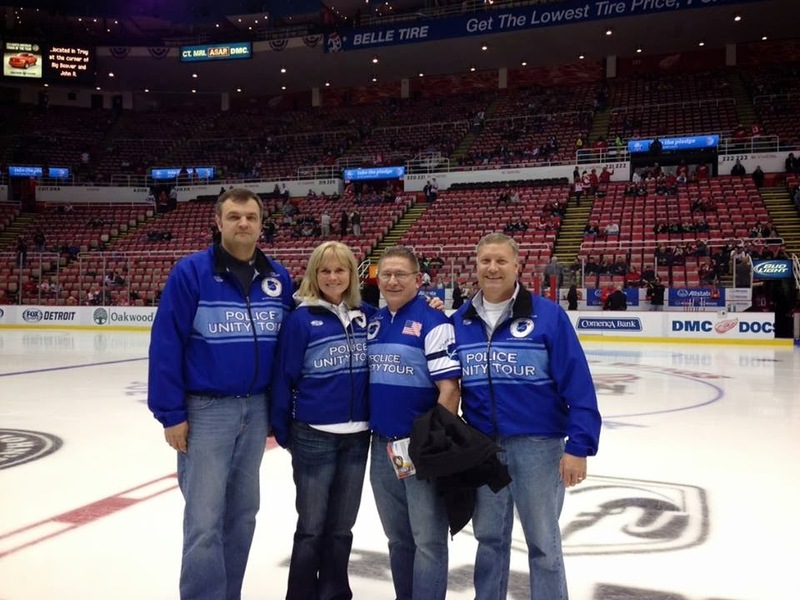 ﻿During the game, representatives from the Michigan Sheriffs Association, Michigan Chiefs of Police, Fraternal Order of Police, Michigan State Police Troopers Association, Federal Law Enforcement Officers Association, Police Unity Tour and Detroit Police Department enjoyed watching the game in the VIP suite. 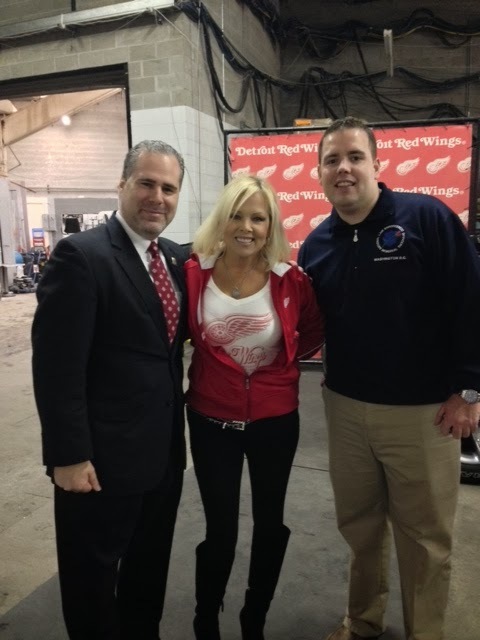 Unfortunately, the Red Wings lost 3 to 4 against the Dallas Stars, but the pre-game festivities and honoring of law enforcement officers and their supporters made for a great event! There are three upcoming VALOR trainings this year in Gainesville, FL; Hamilton, NJ; and Nashville, TN. Each of these trainings is designed to promote officer safety and help prevent injuries and deaths to front-line law enforcement officers in the line of duty. Brian's story began when his older sister Rachel decided she had too many toys and would rather give to others for her birthday. Over the past few years she has donated to different animal rescues, the Special Olympics and Twilight Wish. Brian wanted to follow in his big sister's footsteps, so for his birthday he asked his guests to donate $5 to his cause of choice in lieu of getting him gifts. Last year he donated to St. Jude Children's Research Hospital. For Brian's birthday this year he decided that he wanted to help police families, which led him and his family to the Memorial Fund. 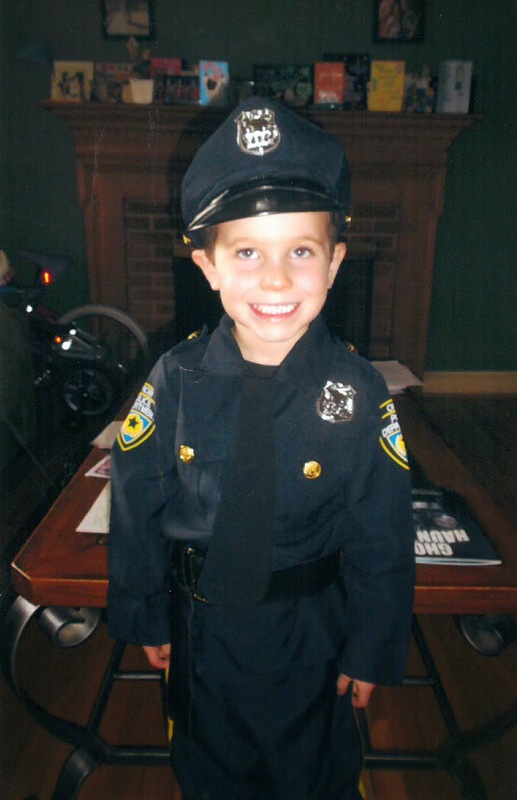 Because his birthday is end of October, it corresponded well with his wishes to be a real super hero for Halloween: a police man. Both of Brian's parents are police officers and they joked about his desired rank—if he wanted to be a Corporal like his Daddy or a Sergeant like his Mommy. He decided to be a Sergeant, much to the delight of his mom! Brian in his Halloween costume. Thank you to Brian and his family for supporting the Memorial Fund. Josh Bowman is a longtime Memorial Fund supporter and Law Enforcement Ambassador. He has served in law enforcement for the last 14 years, starting out with the Chemung County (NY) Sheriff’s Office, and now with the Gates (NY) Police Department. Josh’s support for the Memorial is personal—three of his friends’ names are inscribed on the National Law Enforcement Officers Memorial wall, where they are forever remembered and honored. In 2002, Josh and others started a 5K race to honor his friends and raise funds for the Memorial. Over an eight-year span, their event raised more than $100,000, to support not only the National Memorial, but also Concerns of Police Survivors (COPS), Fraternal Order of Police, and a scholarship fund for the families of the three fallen officers. And in addition to all of this, Josh managed to be an active Police Unity Tour participant for the last six years. 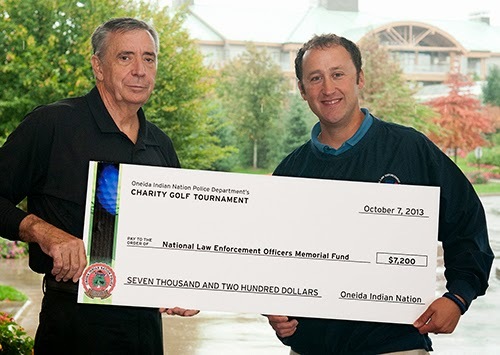 Recently, Josh represented the Memorial Fund at the Oneida Indian Nation Police Department’s Charity Golf Tournament in New York, and graciously accepted a $7,200 check on our behalf (pictured above). And in preparation for our annual Law Enforcement Ride & Run to Remember (October 12-13, 2013), Josh helped connect the Memorial Fund with his friends from Wegmans. With Josh’s help, the Ride & Run to Remember received in-kind support from Wegmans, which included a number of items for participants to grab at pit stops along the course. The Memorial Fund is honored to have Josh as an Ambassador. He is always ready and willing to help support the Memorial Fund’s worthy cause in any way he can. And for that, all of us at the Memorial Fund are very grateful. To learn more about becoming a Law Enforcement Guardian or Ambassador, contact John Shanks at 202.737.8529 or jshanks@nleomf.org. The Newark Police Memorial Walk & 5K Run was created to honor the memory of Chief William Nefosky, a Newark (DE) police officer who died after a battle with Pancreatic Cancer in 2007. In 2012 two other people close to The Newark Police lost their battle with Pancreatic Cancer, Peter Letang and Chris Massaferi. The Newark Police Memorial Run teamed with the family of Peter and Chris this year to raise awareness of Pancreatic Cancer. This year there were two events, a 5K run and walk on April 19, 2013 at the Newark Reservoir and a Guest Bartender night at Catherine Rooney's in Wilmington (DE) on May 16, 2013. The proceeds for this years event were donated in the names of Peter Letang and Chris Massaferi to the National Law Enforcement Officers Memorial, the State of Delaware Law Enforcement Officers Memorial, Compassionate Care Hospice, and the Pancreatic Cancer Action Network (PANCAN). With the money raised from the event, the event organizers purchased two Theater Seats for the National Law Enforcement Museum – one in honor of Chief William Nefosky and the other for the Newark Police FOP Lodge 4.